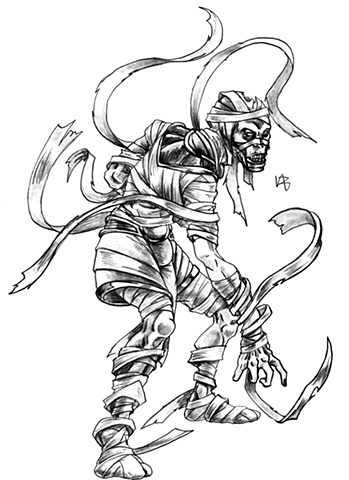 Now this is an actual entity, yet exists as a horror staple, the Mummy. Mummies are the result of a body having their organs removed and preserved, either with chemicals or low humidity conditions to give a well preserved corpse. Now, the practice of mummification exists in various parts of the world, but when the word mummy comes up, Egypt is the most well known as their culture has mummification as part of their belief system. Now, in pop culture, Mummies are depicted as undead creatures who come to life, up to a recent association with curses, thanks to the series of deaths that came upon the explorers who uncovered King Tut's tomb by Howard Carter. My depiction of the Mummy celebrates the Egyptian version using a dynamic pose and with a splash of Mumm-Ra, making its wrappings animate and used as another means of attack. I also use a minimal of rot and using a reference of an actual mummy face to give it the proper desiccated look on its face.